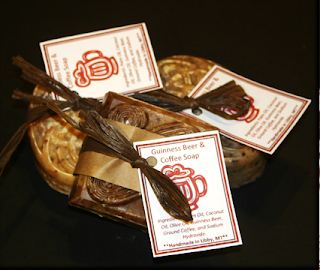 We are finally starting to sell our soap in local stores around town! Jeff and I are very excited about this new project. 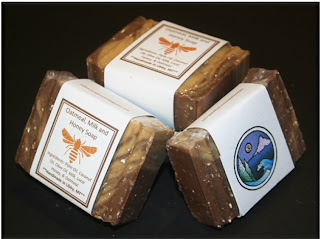 I've been designing label art and coming up with soap recipes, he has been making the soap. Each label is funkified with a picture of one of my many art pieces. The soap has a rustic, groovy look to it. Every batch of soap is formulated to contain 6% extra oil in the soap to create a lotion-like and luxurious feel. Our bars of soap are aged 4 weeks so that they will last longer when our customers take the product home. We've been making soap for ourselves, family and friends for the past 6 years and have developed our skills to the point that we feel ready to sell our soap to north-western Montana and northern Idaho. If you have any questions about purchasing our soap or the soap making process please feel free to e-mail me at karenandjeff@frontier.com. Very cool! Your soap looks wonderful in the photos. Good luck with it, I hope it sells well.